To continually encourage adoption, the Ad Council, who is partnered with The Humane Society of the United States and Maddie’s Fund, recently announced the launch of a second series of public service advertisements for The Shelter Project. Since the launch of The Shelter Project, the adoption of shelter and rescue animals has risen from 27 to 20 percent, dropping from 3 million lives lost to 2.7 million. Like any project, the goal is to make the best possible difference. 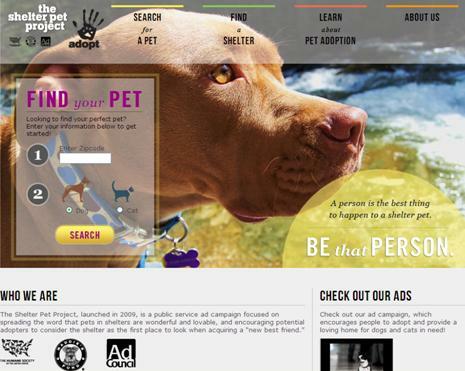 The Shelter Project hopes to save all animals from being euthanized, so they will continue to spread the word through the help of Draftfcb Chicago, who will be working pro bono to design the advertisements for television, radio, print, web, and even the outdoors. The advertisements focus on the loving relationship between shelter pets and their owners, in hopes to encourage others to adopt as well. While the number of euthanized shelter pets has dropped, there are still so many healthy and lovable pets in need of homes. All a shelter pet needs is that one special person to save their life and maybe that one person will encourage another compassionate person to make a difference as well. President of Maddie’s Fund, Rich Avanzino, explained his hopes of the public service advertisements. “We are expecting our new campaign PSAs to connect with the 17 million people who are going to get a pet this year and convince at least 2.7 million of them to adopt from a shelter or rescue,” Avanzino said. “We are hopeful that the new ads will also inspire the 14 million animal lovers who have already adopted to tell their friends why shelters are the first and best places to go for a new four-legged family member.” With the holidays nearing, it seems like the perfect time to bring home a new addition to the family. 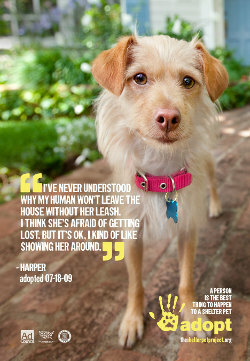 For more information on The Shelter Pet Project, please visit www.theshelterpetproject.org. Here, you’ll be able to search for adoptable pets in your area, read adoption success stories, and learn some important information about pet adoption.